Hello ! 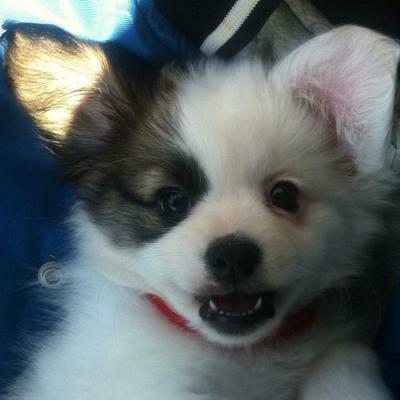 We bought one of the cutest Maltese Papillion puppies Rascal when he was 8 weeks old. 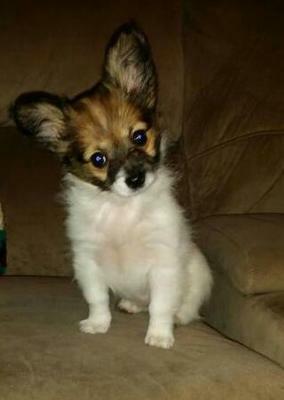 We thought we were getting a full bred Papillon but soon realized he was not as his fur was growing on his face and then we looked online and tried to find pictures that looked closest to Rascal and discovered a Papitese and that was him! 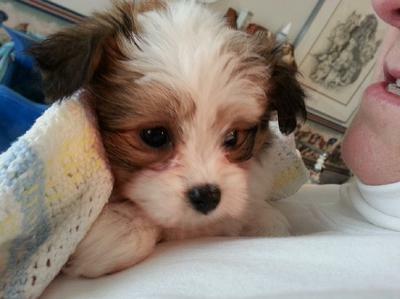 Contacted the breeder and they indeed had a male Maltese so that was that! We love Rascal, he's a great puppy, now 4 months old and 99 % housebroken, he can do basic tricks, sit, lie down, stay, hi five, shake. He's still got issues with getting too excited and biting at our pant legs and fingers but that too is getting better. He went to puppy training, did well and liked mingling with other puppies. He's a very nice companion. He has changed our life for sure, have to think about him 1st before we make any plans but he's well worth it ! awww..rascal is ADORABLE!i have been looking 4 a puppy 4 along time and i think getting a papillion/maltese would definitely b on my list.do u know where i could get one? we adopted a 2 yr old Maltese last year from a family who was forced to move and couldn't have pets where they were,(they were heartbroken) I have found that Maltese sometimes get a bad rap for nipping or barking and biting,..I guess we were just fortunate because our little Cooper is just like our 3rd son..he is a Gem! I love the precious face of Rascal, I am on the lookout for a buddy for my Maltese, but we live in Alabama, again I think Rascal has the face of an Angel..I hope you have many wonderful years with him! 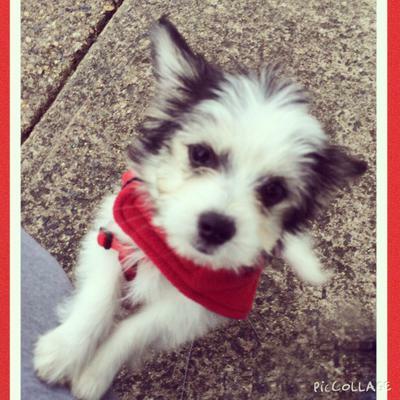 He is the most adorable of all Maltese Papillion puppies, he is playful, and love to be chewing everything especially toes lol... I'm a little worry because he is gaining weight very fast, it is normal? He loves to be around people very smart and easy to train. We got him when he was 2 months old. It's the 3rd month now and he has all ready gained 1.6 lb. We hope he stays relatively small. It took only an hour and constant repetition to learn to sit, lie, and roll. He does not comprehend all the verbal commands yet, but he has memorized all the hand motions as he does each trick. He is VERY spoiled. At night he likes to sleep on my bed, on one of my pillows as he looks out the window. He sleeps all the way through but wakes me up by licking my face, nibbling on my ear and pulling my hair every day at 6:00am sharp. I no longer need an alarm clock! He is very curious, and is not intimidated by big dogs. Yesterday he got his vaccinations, and was exposed to many dogs due to the long line. He was the only small dog in the entire line eager to jump off my arms and play with all the big dogs. He loves strangers, especially kids. What caught my interest was that he never attempts to nibble on kids hands, only adult's. It makes me think whether he knows they are kids. He finally got use to the car movements. He finds a spot on the floor and sleeps through the entire ride. We are hoping that he does the same when riding on planes. Omg!!! he's sooo cute! 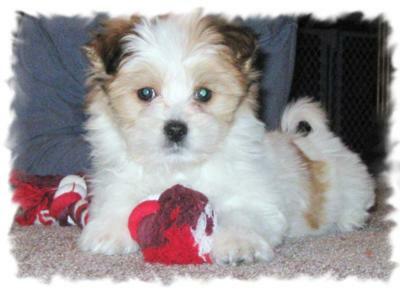 my kids and I are getting our frist papitese puppy in two weeks were sooo happy. How did you go about potty training? My papitese also has gained weight very fast. He was 3.5 pounds at 3 months, now 6 weeks later he is 6 pounds. 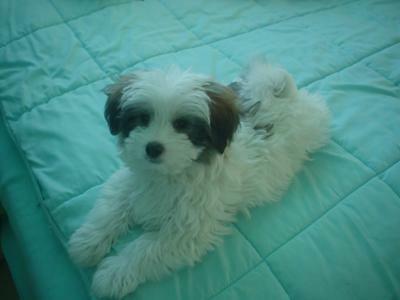 Cherokee (pictured here) at 8 weeks as a Maltese Papillon puppy. She is very cute and cheeky and just loves life, cuddles,running like the wind and adores my cat Ruby... Her white coat has really thickened and got quite long. Her adorable face has got lighter in colour. She is really taking on the Papillon look now that she is 6mths old.Cherokee is a really sociable puppy but hates being left alone and starts sulking before I leave. Callie is the newest addition to my family. Shes a 12 week old Papitese and everything i could ever ask for in a pet. In one word shes PERFECT. 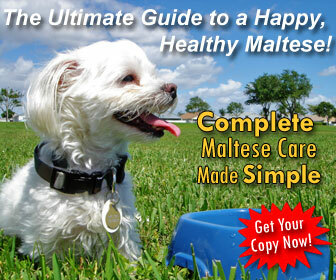 I highly recommend this Maltese mix to anyone looking for a smaller but energetic puppy that will bring years and years of joy. Cuddling is her favorite thing. Also another great trait is she is not very vocal. Within the first 3 days of her being in her new home she didn't bark once. She was very easy to potty train and currently only goes "Potty" on the designated pads that are set out for her. She is the best Christmas present I've ever received. Purebredbreeders.com has the best adoption experience I've ever had. If anyone is looking for a new puppy go check out their website. 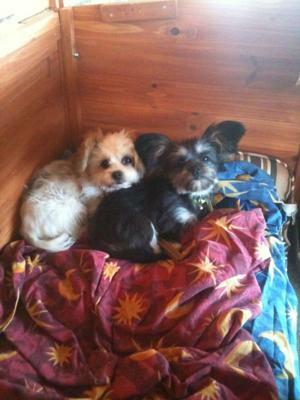 My two Maltese Papillion puppies 4 month old brother and sister. They couldn't be more different!! Dude is so laid back and nothing phases him. When it comes to other dogs no matter how big he stands up to them and barks and barks!! Sooki is extremely playful and bossy to her brother, but she is the biggest scaredy cat ever!! She's just a big sook! They both love going for walks and running around the bush! My Papitese puppies are also excellent with my 4yr old daughter! They could play all day together. And to think she was scared of dogs before we got these guys!!! Our Papitese, Lexi Anne, was born in mid-September 2014, making her just over 9 months old. To say the least, she's definitely still a puppy, and everything that goes with it. She's energetic, playful, loves unconditionally, always wants attention, can be a bit frustrating, and has some trouble listening. Since we brought her home when she was 9 wks old though, she's become a member of the family and we love her to pieces. 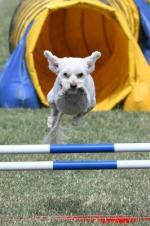 Lexi was born to a Papillon mother and a Maltese father, and she shares the appearance traits of both breeds. 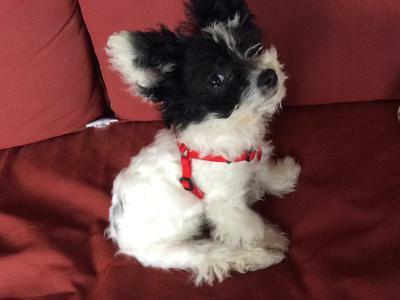 Like her parents, she's a small breed dog weighing about 5 lbs, and is expected to be between 7-9 lbs once fully grown. 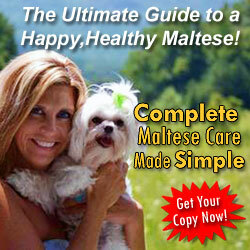 Her body is like that of a Maltese, with her head and tail similar to a Papillon. Her ears are a cross between the two, and are very indicative of her mood. 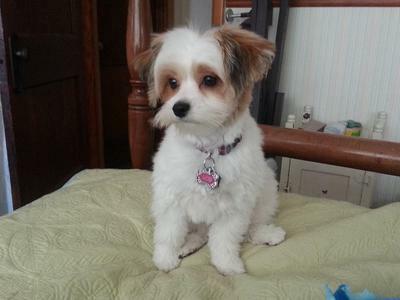 When she's calm or sleepy her ears tend to fold over like a Maltese, and when she's excited about something or playing they stick out like a Papillon. She’s the same coloring as a Papillon: white body, legs, and tail, with brown markings around eyes and covering ears, and a brown rump. Lexi's a long coated dog, and frequent grooming (daily or semi-daily brushing) is a must to keep her this way. For our situation this wasn't practical, and even with brushing her out a couple times a week her hair would get matted (particularly behind the ears, on her rear legs beneath her tail, and in the area where her upper thigh meets her flank). In the pictures you'll notice several hair lengths: the length when we adopted her, when it got longer, her first haircut, then her second (and shorter) haircut. I've noticed there can be some variety in the coat types of Papitese dogs, and in Lexi's case it would be considered wavy. When long and combed it appears strait, but when you pet her you can actually feel the waves in her coat near the base of the hair. The slight wavy curl is outwardly apparent when her hair’s trimmed. Lexi’s super soft, and reminds me of a plush teddy bear. 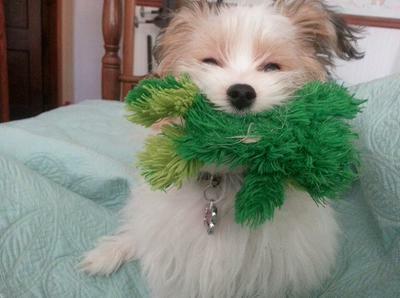 Lexi’s definitely playful, to say the least. She loves to run and jump on everything (and everyone), and when she can't reach she's been known to use humans as her personal climbing platform. For example, she loves laying on the back of the couch (so she can see out the windows) but doesn't quite have the jump power to get up there on her own. Her solution: using whoever's sitting on the couch as a ramp, she goes from lap, to chest, to shoulder, to her final destination of sitting behind your head and staring out the window. She's also a big fan of games like tug-o-war and wrestling with her sister (a Jack Russell/Norfolk mix named Lola). Lexi has a TON of energy, and it takes quite a while to run out, but when it does you know. She usually ends up passed out on the couch or in someone's lap. It's likely that she'll still be a high energy playful dog in her adulthood, however I’ve recently noticed that she's starting to chill out a bit. For example, she’s not playing all the time anymore; now she seems content to sit in your lap or lay by your feet or her sister for significant periods of time. As seems the case for the majority of this crossbreed, Lexi’s very affectionate and loving. She loves to be near her people, though not always on them. She gives kisses galore every time you pick her up, and if unable to reach your face she'll settle for licking your hand, arm, or leg for 20 minutes. She’ll follow you around the house as you clean, cook, or work, and often naps on the ground, out of the way, but close by when you're busy. She eats and drinks very frequently (small dogs have faster metabolisms and need to eat frequently to keep their blood sugar in check), but isn’t food aggressive at all. As she's gotten older, she's started imitating Lola (our other dog) and takes a bit of food in her mouth then steps away from the bowl to eat to allow others a chance at the food. She's friendly with other dogs, but is a bit wary of larger breeds and prefers to watch them at first rather than play. Once she's been around them for a while though, this nervousness goes away and she joins in. She's only been around children a few times but was affectionate and non-aggressive on both occasions. Lexi’s protective of her territory however, and is an effective watch (not guard) dog for the house. She alerts you to anyone walking in front of the house or parking their car outside. The downfall to this trait is that she’s also noisy, since she barks at every living thing that comes near the house (including stray cats, squirrels, birds, etc), and sometimes doesn’t even know what she’s barking at. For example, Lexi can be sleeping when Lola sees someone walking outside. Lola barks which wakes up Lexi, and she starts barking. By the time Lexi gets to the window, the person outside is gone and Lola’s stopped barking, but Lexi will keep going for another 5-20 minutes because she doesn't know what she was barking at is gone. While Lexi’s very affectionate and sweet, make no mistake, training hasn’t been and still isn’t easy. She's stubborn and not fond of listening to commands unless there's a food reward involved. A good example of this is the loudness/barking problem previously mentioned. Another example is teacher her what is and what ISN’T okay to chew. For example, squeaky toy --> okay; glasses, pens and other items sitting on the end table by the couch --> not so much. Several times I have taken a pen or sharpie away from her, told her "No", and scolded her, then set the pen back on the table. Next I’ll walk into the kitchen to grab a drink, come back and she’s chewing up the same item I just took away. This is no doubt the behavior we struggle with most. Her two favorite things to chew are hard plastic and paper items (napkins, paper plates and bowls, tissues, etc). Pretty much, if it's within her reach and you're not looking you can bet she's going to try and take it -- kind of like a toddler who just learned to walk. Honestly, I have no idea how to break her of this and am hoping that maybe someone else can offer me some advice. Potty training with all dogs is difficult, but this one seems particularly so. Since she's such a small dog, she potties more frequently (about every 4 hours), so it's difficult trying to adjust her to our human 8 hour workday schedule. The main difficulty is teaching her to alert when she has to go, so we know to let her out. Thankfully, Lola’s helped with this immensely. Lexi’s begun copying Lola's alert behaviors, and when it’s unnoticed, Lola starts alerting us for her. Treats and praise have also been effective for potty training. I praise her while she goes, then she receives a treat upon returning inside. We still have accidents though when she doesn't alert, and unfortunately she's not good about going on the potty pad. I'm not sure why this is or how to correct it. I've tried spraying the pads with outdoor spray, but it hasn't worked. Another problem is that she's what I call a "mooper". In other words, she moves (walks) as she poops, and a significant distance too. She generally travels between 6 and 12 feet each time, leaving me to clean up several little messes across the floor/outside. Needless to say, we're still working on it, but we’re getting better little by little. If I had to grade it, I'd say we're about 60% there. So, still failing, but succeeding more than half the time. We're also trying to break her mouthing habit. 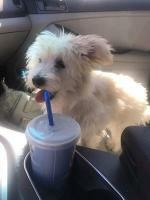 While common for puppies, especially ones teething, it’s been going on too long. She doesn't bite or break skin, but she does apply a bit of pressure, similar to when wrestling with Lola. We're working on teaching her that what's okay with Lola isn't okay with humans, but it's a difficult task, especially when she's excited. When you go to pet her, the first thing she wants to do is play and put your hand in her mouth. Our response to this is to take our hand away and stop petting her for a minute, then we try again, she mouths again, and the cycle repeats until she doesn't mouth and we praise her. I’m hoping this behavior just takes some more time and isn’t a long term thing. So far, Lexi’s been a very healthy and happy puppy. She had a small umbilical hernia when we adopted her, but it didn’t pose a health risk, so we waited and had it taken care of when we had her spayed. I'm not sure if it's just our Papitese or if this is common across the breed, but she seemed particularly affected by her immunization booster shots. They didn't make her sick, but she was in obvious pain. After we brought her home, she would cry whenever we picked her up or moved her, and whenever she re-positioned herself. During this time, it appeared the actual thigh muscle (injection site) was in pain. By the next afternoon, she was back to her normal self. We described the situation to our vet, and during the next set of shots Lexi received pain medication that helped quite a bit. Just like the Papillon and Maltese breeds, Lexi’s also affected by watery eyes. They’re not a health concern and don’t affect her vision or irritate her in any way, but they do produce dark reddish tear stains. This happens to many small dogs. In our case, we just wipe them down every now and then with a tissue or wet cloth to prevent any gooey build-up, and to get rid of some of the stain. If you’re interested in owning a Papitese, I tried to provide as much information as I could so you could get a better idea of what you’re getting in to. Keep in mind though, not all dogs are the same. They're all unique creatures with different personalities and different problems and pleasantries. If you have any other questions for me or suggestions for my training issues (*fingers crossed*), feel free to comment. We love our little Lexi, as stubborn and quirky as she is and would never trade her in for another. She's got a personality all her own, and I love every amusing bit of it. We have a papitese, Cricket, who will be 8 years old in early November. She sounds exactly like Lexi Anne, and looks much like her, too. Cricket has yet to slow down and she enjoys getting things such as pencils, pens, paper, whatever she shouldn't have. But for her, she will get something and go look at us - she's ready for a chase! The worst was when she got hold of a blue marker. She was blue, the carpet was blue. We had to laugh! She has us perfectly trained - when she thinks it's bedtime, she will sit by our bedroom and stare at one of us. She has been nothing but fun since the day we got her. Like I said, she shows absolutely no sign of slowing down. She is so much fun! Enjoy Lexi Anne! She is a cutie!